The Caledonian Residence is an elegant mix of the historic original Edinburgh tenement with very tasteful modern touches throughout. Very spacious and comfortable and has the perfect location in central Edinburgh. This second floor apartment is ideal for couples and families with young children. The apartment sleeps four but up to 6 using the double sofa bed located in the living room. (This carries an additional charge). In keeping with the Victorian age, the apartment has the typical high-ceilings, which give the whole flat a very spacious and airy feel to it. The spacious sitting room and master bedroom overlook the street and city rooftops. The kitchen/dining room and second bedroom overlooking the rear of the building. The kitchen is fully equipped and has been recently upgraded with new modern appliances - fan assisted electric oven, gas hob, fridge/freezer and dishwasher. There is a dining table and 4 chairs for your meals. The shower room is elegant and compact, with shower cubicle, toilet and heated towel rail. One of the highlights of visiting this iconic city is the world famous Edinburgh Castle fortress, and during the month of August you have the opportunity of attending the magnificent and unforgettable Edinburgh Tattoo where the worlds' bagpipe bands and various other cultural musicians and groups present their talents. Also during the month of August the Edinburgh Festival Fringe takes place. This is the world's largest arts festival, which runs over 25 days with performances and different shows from every corner of the world. Don't forget we have wonderful galleries, museums, theatres and so many other magnificent tourist attractions. Yes, there is so much to see and do! Edinburgh is also the perfect stop to journey on to visit the rest our beautiful Scotland. One of Edinburgh's train stations, Haymarket is a mere 450 meters away. The Tram, with direct lines to Edinburgh Airport, stops just outside Haymarket Train Station. The Old Town High Street, now known as The Royal Mile is 1.3 miles, and the West End of Princes Street only 0.7 miles away which is an easy ten minute walk. There there are dozens of restaurants and fast food chains. Gas central heating ensures constant supplies of hot water. 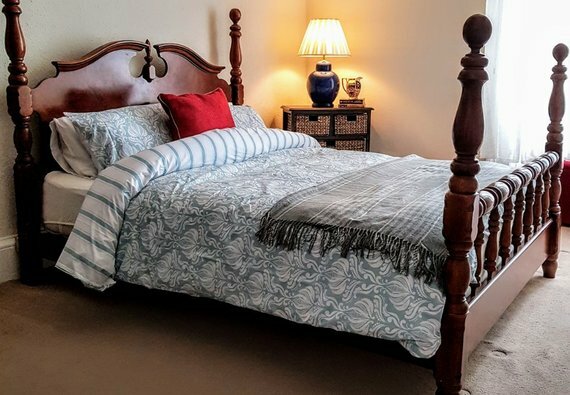 We use professional cleaners to clean the property before you arrive and hire in hotel quality linen for soft comfy sheets and big fluffy towels, giving you all the comforts of home with a hotel quality clean. Access is from street level, through an entry-phone controlled outer door, then up one flight of stairs to the main door of the apartment. If you are arriving earlier than 16:00 on your day of arrival, it is always worth contacting the property manager as they will always endeavour to give you access as soon as possible. You may be able to arrive early and leave luggage and come back, however this is not guaranteed. Sleeping arrangements The master bedroom features a comfy king size bed. The second bedroom has 2 bunk beds. There is also a Sofa bed that sleeps an additional 2. Exterior Victorian tenement flat, built around 1880. No reviews yet for The Caledonian Road Residence.